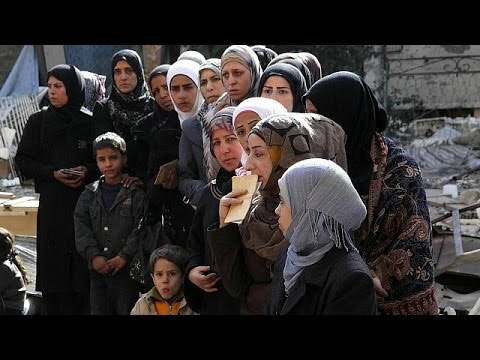 UNITED NATIONS (IPS) – The head of the United Nations agency for Palestinian refugees has described the situation inside the Syrian refugee camp of Yarmouk, under attack by Islamic State (IS) militants, as “one of the most severe ever” for the already spartan camp. Fighters allegedly from the IS, and al-Qaeda affiliate al-Nusra, began their attack on the camp, on the outskirts of Damascus, on Apr. 1. By Apr. 4, the Syrian Observatory for Human Rights reported that 90 percent of the camp was controlled by militants. Around 18,000 people, including 3,500 children, are believed to be trapped inside Yarmouk. Pierre Krähenbühl, commissioner general for the United Nations Relief and Works Agency for Palestine Refugees in the Near East (UNRWA), told a press briefing Monday the current situation was among the most dire faced by refugees in the camp, already under siege for two years and suffering from a lack of food, water and medical help. “The current escalation has made the hour more desperate than ever for civilians inside Yarmouk,” Krähenbühl said via videoconference from Jordan. On Sunday, UNRWA released a statement demanding access to the camp. “The lives of civilians in Yarmouk have never been more profoundly threatened,” the statement read. Krähenbühl was unable to comment on how much of the camp may be under militant control, but conceded that affected areas did house the highest concentration of civilians. Reports from Yarmouk include alleged beheadings by IS members, but Krähenbühl was again unable to comment, saying UNRWA had been “unable to independently verify” such reports. U.N. Secretary-General Ban Ki-moon and the Security Council have been briefed on the situation. While it is unclear what, if any, action the U.N. may take, Krähenbühl made several cryptic comments calling on the international community to “influence” armed groups to curtail their offensive. “There are no easy solutions … messages have to be passed to all the parties and armed groups inside Yarmouk that respect for life is an element not only in international law, it is a fundamental human principle that is found in all religions,” he said. When asked whether UNRWA had any direct contact with IS, Krähenbühl said no. “It is not up to me to give any indication on who may channel messages to different parties, including the armed groups inside Yarmouk,” he said.